KAYAK recently picked the minds of its own employees to give travelers advice for the holidays and beyond, from “surviving holiday mayhem” to the unwritten rules of travel to the best airport bars and restaurants. The travel search engine surveyed 75 KAYAK employees on a variety of travel topics in October. About 70 percent of them were KAYAK “data junkies,” who crunch the travel data of consumers on Kayak.com to deliver travel trend reports and travel tips. But when KAYAK employees, or “KAYAKers,” aren’t crunching numbers, they’re traveling around the world, enduring the same challenges and annoyances all of us travelers do. When it comes to holiday travel, that includes downloading a good podcast such as Serial and kicking back with a glass of wine, taking the longer route to your destination to explore the local airport bars and cafes and inquiring about local hotspots instead of regular tourist attractions when visiting a new city. KAYAK’s five travel commandments are: Thou shalt stay seated until your zone is called to board (don’t block the walkways), thou shalt not take a child on a red-eye flight, thou shalt not take thy shoes off on the plane, thou shalt not be an armrest thief and—most importantly—thou shalt alert thy neighbors before reclining thy seat. Given the number of incidents recently that have spawned from passengers growing irritated with reclining seats, Katime wasn’t exactly shocked by that last commandment. Some of the top airport bars and restaurants highlighted by KAYAKers included: Blue Smoke at JFK Airport, Joe & the Juice at Copenhagen Airport, Stock Car Café at Charlotte Douglas International Airport (a NASCAR bar dedicated to Bud Light), Airbrau at Munich Airport (which has its own brewery and serves Bavarian food) and Ramen Alley at New Chitose Airport (a special area of the food floor is dedicated to ramen). When it came to staying connected, 53 percent of KAYAK employees said they try to find free Wi-Fi wherever they can, while only 18 percent said they are completely off the grid when they travel, demonstrating how important Wi-Fi is to travelers today. Of course, if you travel a far distance, jet lag can be a problem once you land. But nearly half of KAYAKers (49 percent) opt to push through jet lag instead of taking an Ambien (or two) to sleep on the plane (26 percent). Interestingly enough, Katime said the European KAYAKers surveyed generally preferred to push through it, while their American counterparts were more inclined to take an Ambien and doze off. 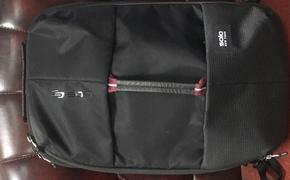 KAYAKers were also asked what the most underrated KAYAK travel tool was. A whopping 49 percent praised My Trips, a trip planner within the KAYAK app. With My Trips, users can forward their travel details to trips@kayak.com and an itinerary in chronological order will automatically be created. There’s also a “Taxi” view that shows local cab drivers the details of the user’s hotel reservation in the destination’s native language, avoiding any chance of something being lost in translation. And while Jackson Hole, Wyoming, has long been known as a premier skiing and snowboarding hotspot, one KAYAK employee from the Stamford office was more impressed with the flight into the destination. “The flight approach into Jackson Hole, Wyoming is so memorable; there’s nothing but mountains as far as your eyes can see,” he said. So, whether you are traveling during the holidays or waiting until the crowds recede, you may want to keep these tips from KAYAK employees in mind. 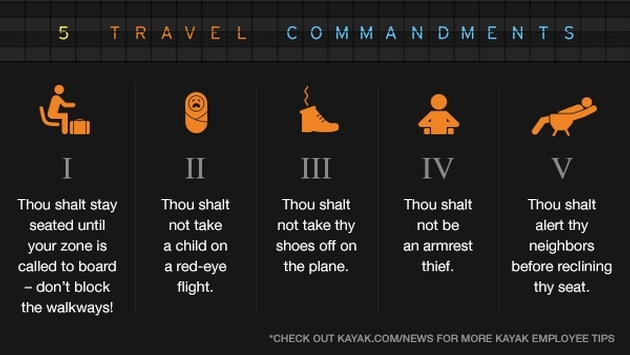 And, please, be a good traveler and heed the five travel commandments. Travelers around the world beg you. For the full KAYAK survey, click here.